*Chair Frame. (Stoop sales and flea markets are good sources and frames are usually cheap if the cloth is in rough shape). *1-2 Yards Outdoor Fabric. (We used some from Jo-ann Fabric). 1. Strip off damaged fabric, remove any staples or tacks and refinish chair frame if desired. We didn’t need to refinish ours, but did have a lot of staples to pry out. A flat screwdriver works well for this. 2. Measure chair and cut fabric to fit. Every chair design will be slightly different. For my chair I was able to slide the back fabric on, but had to hand-stitch the seat fabric in place. Make sure you look carefully at your frame before stitching a loop closed! 3. Using the sewing machine, stitch fabric for the back into a tube shape. I also stitched vertical seams along the back of the chair, leaving space for the wooden bars to be inserted. This keeps the back in place nicely, but is not crucial. 4. For the seat I folded two layers of fabric for extra strength and then made a loop. Since my seat bars weren’t open like the back, I first hemmed my edges and then used a needle and thread to sew the seat loop in place. After stitching it is easy to rotate the loop under the chair and hide the seam. *We found a similar chair last week at a stoop sale for me. It was only $8 and came from the seller’s grandpa. 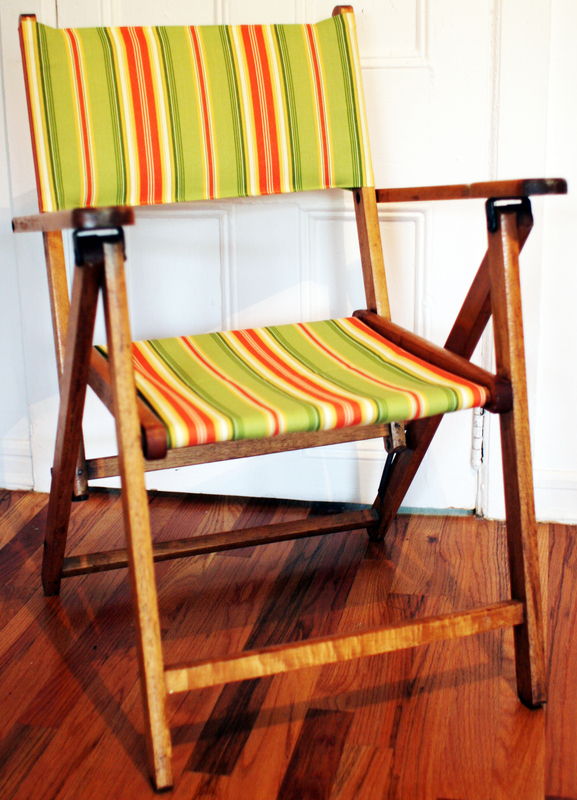 We are on the hunt for some cute kids chair frames, and looking forward to some lemonade and lounging in the back yard! Another amazing accomplishment. Does the top (shoulder) backing have filling or fabric only? Beautiful Jeanne. Your projects and posts continues on to be inspiring and motivates one to give it a try. No stuffing on the back. It is just pulled taught by the stitching.